Cold day ahead for Wyandotte County – Welcome to Wyandotte Daily! A cold morning and a cold day are ahead for Wyandotte County, as temperatures will rise to a high of 33 today, according to the National Weather Service. It was 22 degrees at 8 a.m., with a wind chill reading of 14 here, the weather service said. Similar cold mornings will be possible on Saturday and Sunday morning as well, according to the weather service. A strong weekend storm system will stay to the south, and snow is not in the forecast for Wyandotte County on Saturday, the weather service said. The next chance for rain and snow is Wednesday night, according to the weather service. Today, it will be mostly sunny with a high near 33 and an east wind of 5 mph becoming calm in the morning, the weather service said. Tonight, the low will be around 21 with an east northeast wind of 3 to 5 mph, according to the weather service. 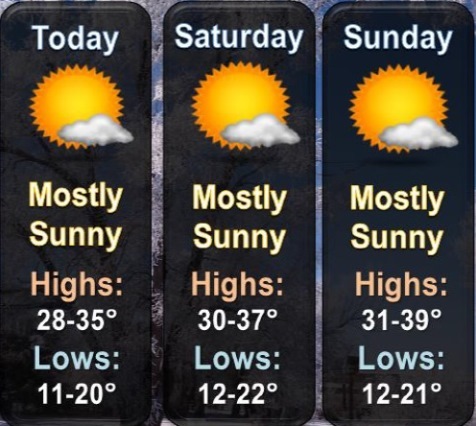 Saturday, it will be mostly sunny with a high near 36 and an east northeast wind of 5 to 8 mph, the weather service said. Saturday night, it will be partly cloudy with a low of 19 and an east northeast wind of 3 to 6 mph, according to the weather service. Sunday, it will be partly cloudy with a low of 19 and an east northeast wind of 3 to 6 mph, the weather service said. Sunday night, it will be partly cloudy with a low of 20, according to the weather service. Monday, it will be sunny with a high near 39, the weather service said. Monday night, it will be clear with a low of 24, according to the weather service. Tuesday, it will be sunny with a high near 47, the weather service said. Tuesday night, it will be mostly cloudy with a low of 35, according to the weather service. Wednesday, it will be mostly cloudy with a high near 47, the weather service said. Wednesday night, there is a 40 percent chance of rain and snow, with a low of 32, according to the weather service. Thursday, there is a 30 percent chance of rain, with a high near 44, the weather service said.